A comic strip explaining how the settimana junior works… Much of the aura surrounding the ochs und junior settimana junior is created through the use of illustrations… And how does that all work out in reality? Sjoerd has been sketching, enjoying flights of fancy, meditating, inventing, creating – and now the settimana junior comic strip is ready. Late last night he delivered the image data (in full colour) to Genius Media. It’s being printed today, and it will be bound by Heggli in Winterthur tomorrow. Friday will see us sending out the first few settimanas to their new owners – including one in Los Angeles – complete with the definitive version of Sjoerd’s comic. 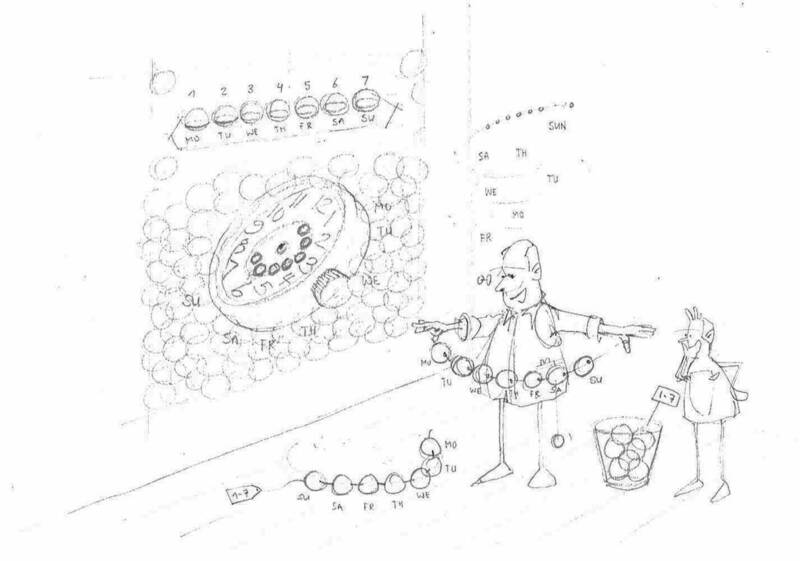 So how does Ludwig Oechslin explain the workings of his weekday calendar display without the use of words? Sjoerd used the above sketch to pose this question in an email to me last Tuesday – we’ll have to wait until Friday morning to know the answer – thanks, Sjoerd!